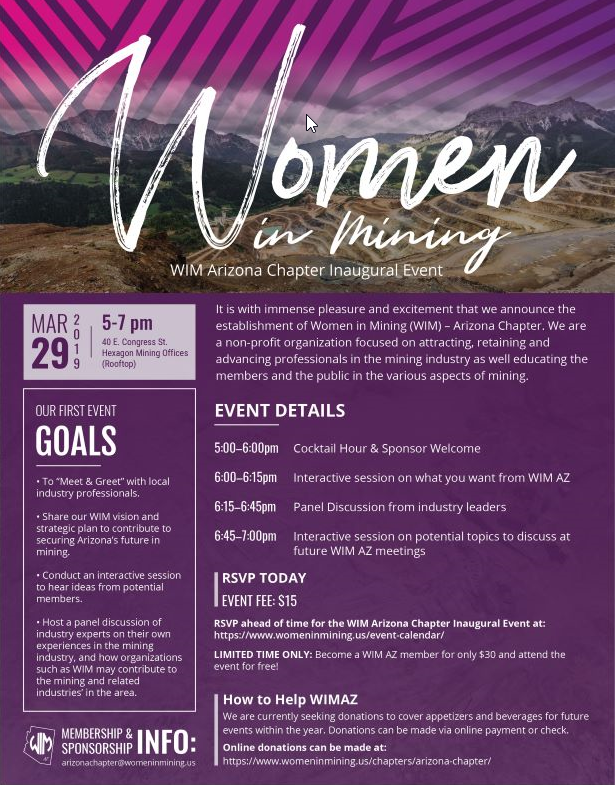 March 29, 2019 -- Women in Mining Arizona Chapter Inaugural Event! Women In Mining will be hosting their “Inaugural Event” on March 29th, 2019 5-7pm at the Hexagon Mining office in Tucson. Moderated by Brad Ross, Director IMR UA More information on the WIM AZ membership benefits, goals and strategic plan will be detailed at our Inaugural Event. 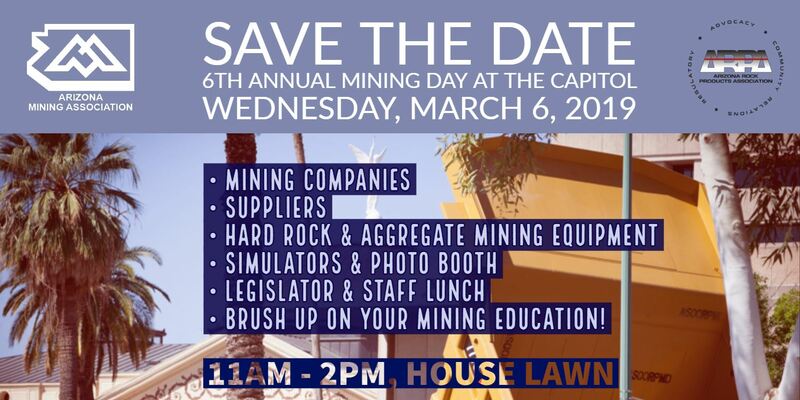 March 6, 2019 -- 6th Annual Mining Day at the Capitol! 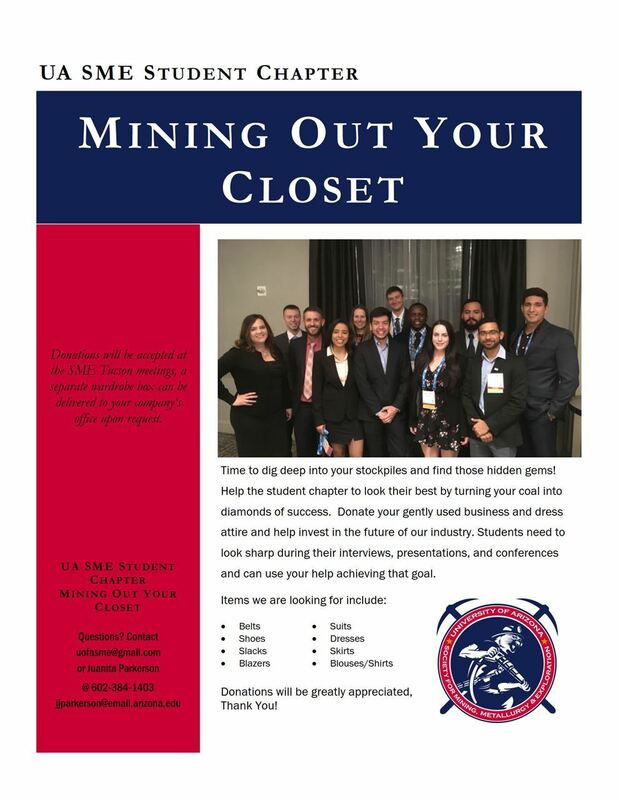 August 25, 2018 -- Mine Out Your Closet! 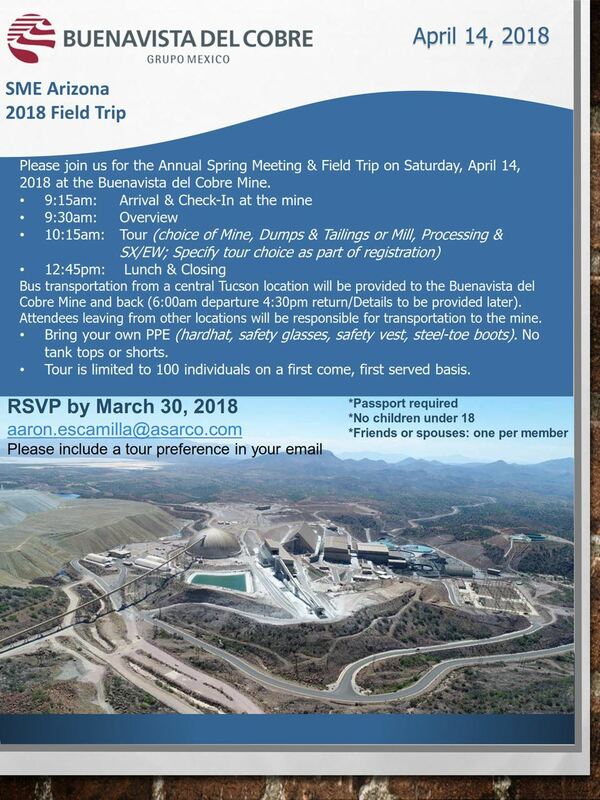 The SME Arizona 2018 Field Trip will take place on April 14! Please contact Aaron Escamilla to make your reservations! Reservation deadline is March 30! As they earn degrees from the University of Arizona and put them to use, the men and women featured in this series of articles are defying expectations about who mining engineers are and what they do. Follow this series in the UA College of Engineering News page. On 26 March 2018, Arizona Mining’s Don Taylor, discoverer of the world-class Taylor zinc-lead-silver deposit in the Patagonia Mountains of southeastern Arizona, spoke with AZGS for the 44th episode of the Arizona Mining Review e-Video Magazine. You can view that 11-minute interview at our AZGS Youtube channel. Watch your email and our website for details! 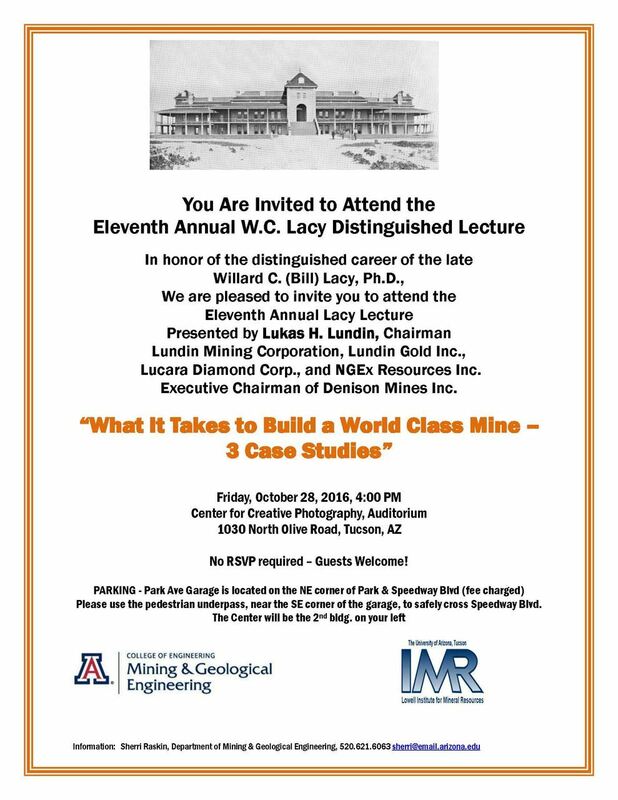 Women in Mining, Celebrating a Journey of Success is hosted by the Southern Arizona Business Coalition (SABC). 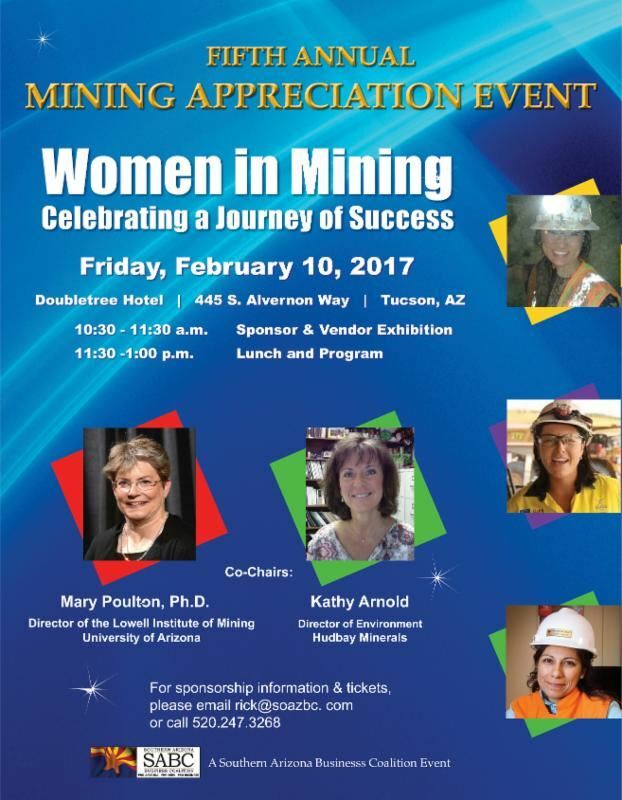 The event will take place on Friday, February 10, 2017 and will acknowledge Arizona's history in mining and pioneer roles women held as prospectors, assayers, investors, and independent female mine owners. For sponsorship opportunities contact Rick Grinnell (520-247-3268). 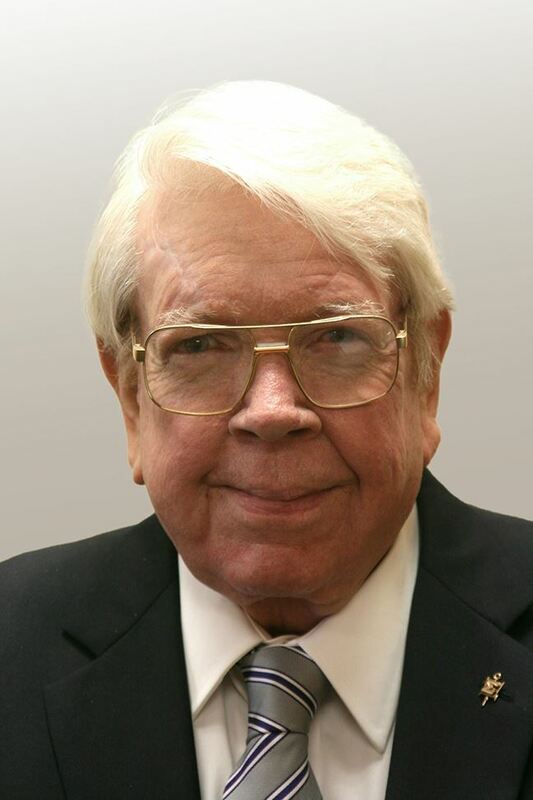 It's with heavy hearts that we announce that Dr. James William White, 77, passed away on Saturday, January 8, 2017, from injuries sustained in an automobile accident that occurred on December 28, 2016. 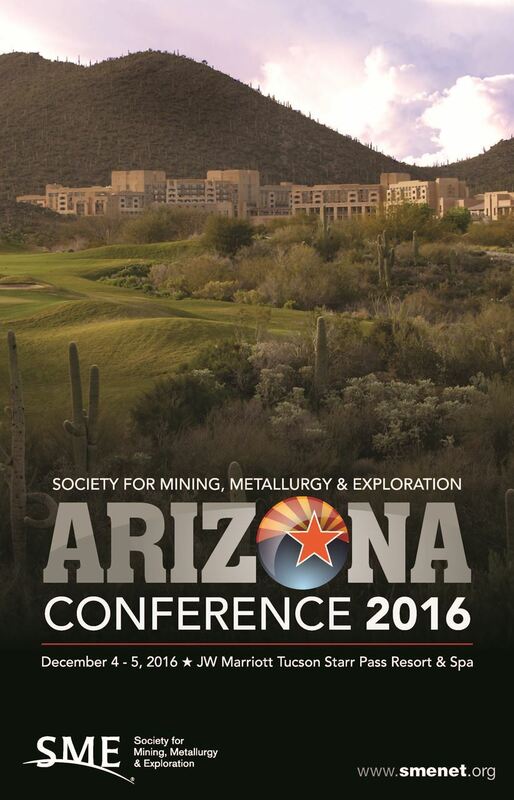 The Society for Mining, Metallurgy, & Exploration is hosting their annual SME Arizona Conference. The SME Arizona Conference is a can't-miss regional conference that provides a great opportunity for collaboration and growth of the Mining Industry in the Southwest, specially Arizona. The SME Arizona Conference will be held at the JW Marriott Starr Pass Resort & Spa on December 4th and 5th. Also, The University of Arizona SME Student Chapter will be hosting their 21th Annual Diggers and Duffers Golf Tournament. For more information click here. 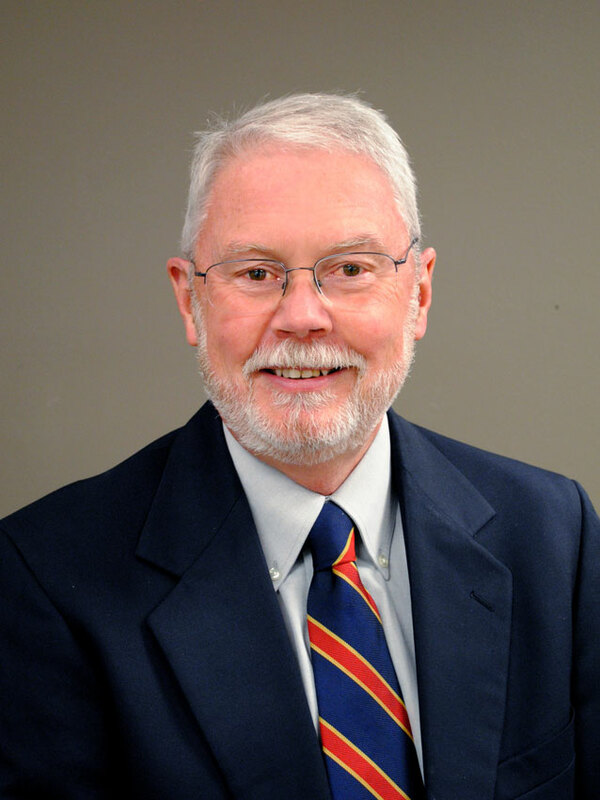 It's with heavy hearts that we announce that Dr. M. Lee Allison, State Geologist and Director of the Arizona Geological Survey, passed away Tuesday, August 16th, after suffering a critical head injury from a fall at his home on Saturday, August 13th. Lee’s passing is a tragic loss for his wife, family, staff of the Arizona Geological Survey, the geologic and geoinformatics communities, and Lee’s broad circle of friends, colleagues, and acquaintances around the world. There will not be a memorial service. Lee’s family has requested they not be contacted. Any messages of condolence can be addressed to AZGS (Arizona Geological Survey) team members who will pass them along to his family. Join your mining friends at MineBLAST on July 13 at Barrio Brewing in Tucson. This informal summer mixer is co-hosted by SME Tucson and Young Miners of SME Arizona and all mining organizations are welcome to join us. Thank you to sponsors Schlumberger Water Service, McCraren Compliance and Hexagon Mining. Click here for more info. A native Idahoan, Mike Carter was born on October 27, 1944 in Boise, ID. He went on to graduate from the University of Idaho in 1967. As a geologist, he traveled the world for the next 48 years, overseeing various mining operations from explorations to productions. From Armenia to South America, Arizona to South Dakota and numerous other states, his skills and personality took him all over the map. Mining, fishing, and golf were his passions, his sharp wit will be missed. The family is working on his life history and has asked anyone who worked with Mike in Arizona or Nevada in the 70s and 80s to contact them at (Zach) 205-253-5751 or (Bill) 208-860-0896. February 3, 2016 -- Know Any YOUNG Miners? 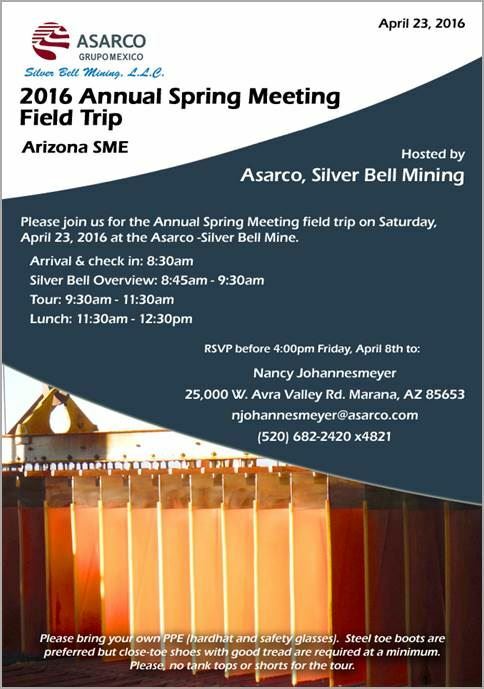 Know any young miners?Tell them about Young Miners of Arizona! Initiated in 2015, this new Arizona SME group targets members with 15 years or less experience in the mining industry. It is a great transition for newly graduated students and professionals to connect with their peer group. Click the links below for more information! December 25, 2015 -- Merry Christmas and Happy Holidays! 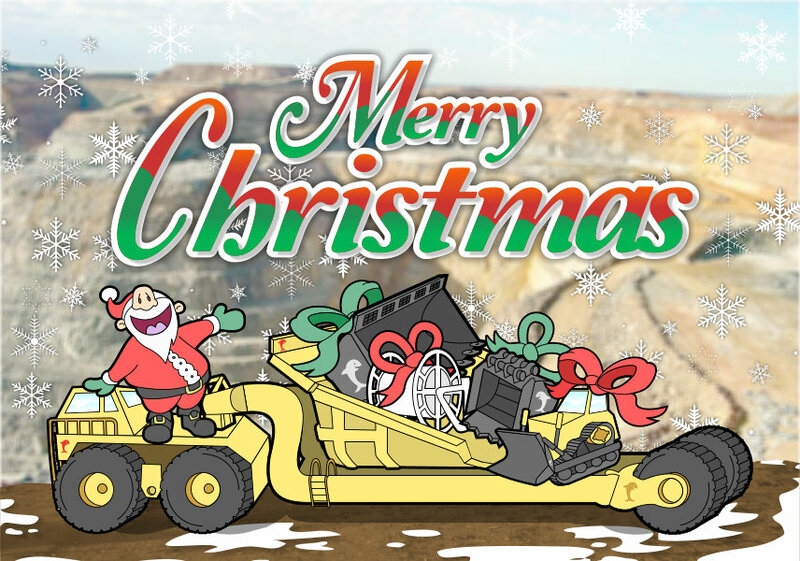 The Tucson SME Section would like to wish everyone a Merry Christmas and Happy Holidays! Spend some quality time with your loved ones and please be safe! 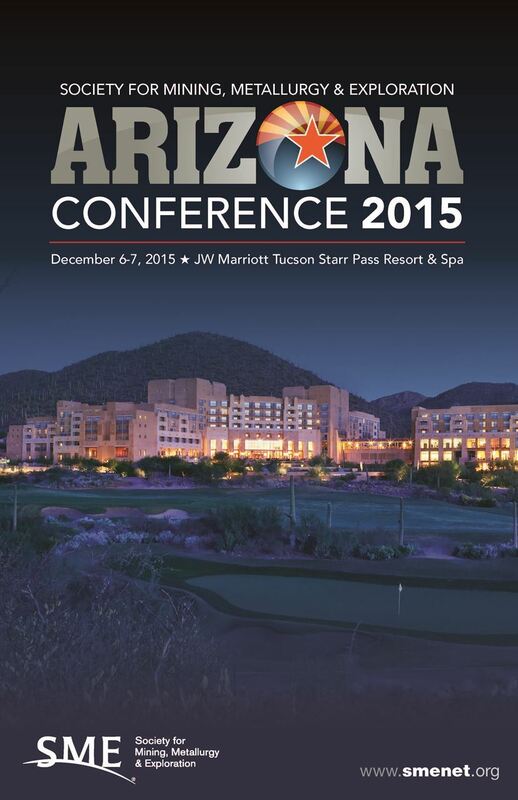 The SME Arizona Conference will be held at the JW Marriott Starr Pass Resort & Spa on December 6th and 7th. Also, The University of Arizona SME Student Chapter will be hosting their 20th Annual Diggers and Duffers Golf Tournament. For more information click here. 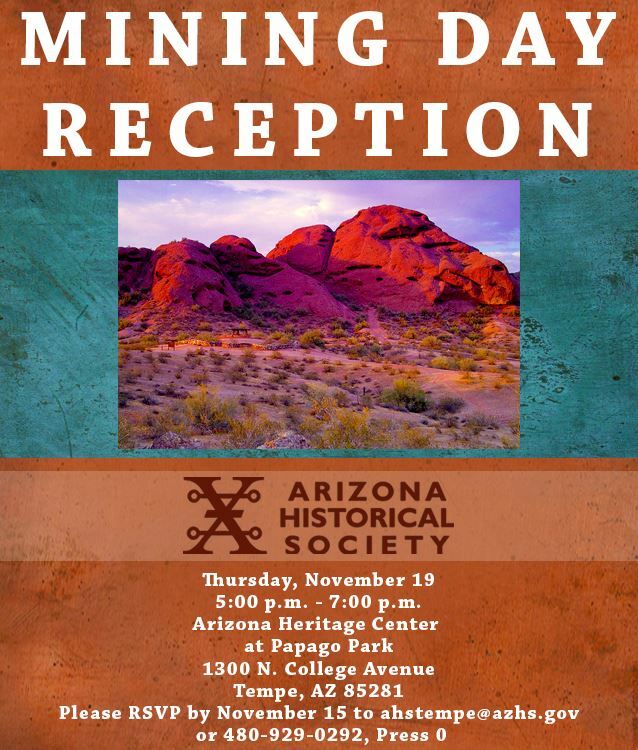 SME Tucson Section invites you to attend the Arizona Historical Society Mining Day Reception on November 19, 2015 in Tempe, AZ. 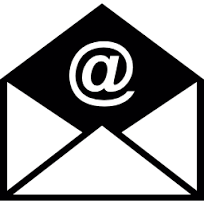 RSVP deadline is November 15. For more information click here. 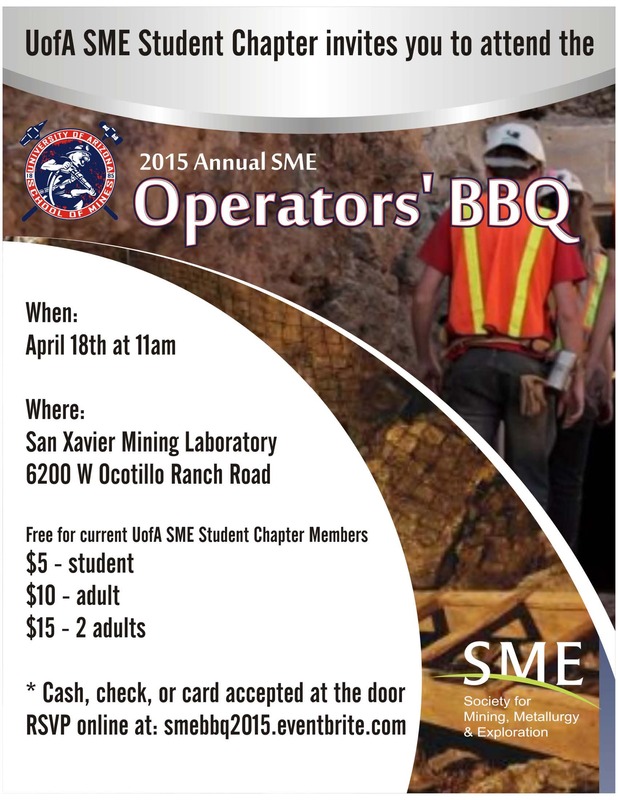 Please support the University of Arizona SME Student Chapter and sign up for their 2015 Annual SME Operators' BBQ! More information can be found here. We hope to see everyone at the Colorado Convention Center in Denver for the 2015 SME Annual Conference & Expo. Conference dates are February 15-18. Safe travels. Click here for more event information. Jan 1, 2015 -- Happy New Year! The SME Tucson Section would like to THANK YOU for making 2014 a wonderful year and wish you nothing but the best in 2015! 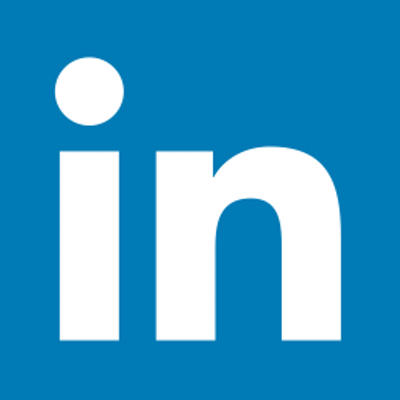 We now have a LinkedIn group specifically for the members of SME Tucson Section to network, share events and get to know one another better. You can find our group by searching "SME Tucson". If you would like to participate but aren't a member yet, there's no better time to join in than now! 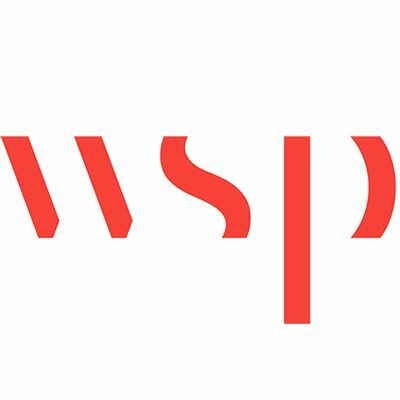 Mike Humphries, Director of Engineering Studies, Hudbay Minerals, will introduce Hudbay Minerals, operations and projects and the acquisition of Rosemont Copper. Jul 11, 2014 -- MineBLAST 2014! Eat, drink, and enjoy. Learn about the University of Arizona SME Student Chapter! Looking for a job? Check out the SME Career Center! Click Here!